I happened to come across photos on the Internet of Johnny Depp portraying bank robber John Dillinger and Christian Bale as Melvin Purvis, the FBI special agent who pursued Dillinger and the other bank robbers during the 1930s. The two fine actors lead the cast in an upcoming film called Public Enemies. The film, directed by veteran crime film director Michael Mann, is based on Bryan Burrrough's excellent book, Public Enemies: America's Greatest Crime Wave and the Birth of the FBI, 1933-1934. I read the book with some relish a few years ago, as I've long been interested in the Depression-era criminals and the early history of the FBI. Like Truman Capote, who once said that if he had studied medicine with the same intensity that he had studied crime, he could have been a brain surgeon, I've long been a student of crime. I grew up watching cops and robbers on TV and in the movies, and I became an avid reader of crime fiction as well as crime history. As a writer, I've covered crime for newspapers, magazines and Internet publications for a good number of years. The names of criminals like John Dillinger, Baby Face Nelson, Pretty Boy Floyd and Bonnie & Clyde are better known than most presidents. Unfortunately, what most people know about these criminals they've learned primarily from the movies. While movies can be entertaining, most of them are historically inaccurate. The movies have also glamorized the criminals. The movies also gave us a somewhat whitewashed version of the early FBI's role in capturing and killing the Depression-era gangsters. In films such as Jimmy Cagney's G-Men and James Stewart's The FBI Story we see a sanitized FBI and the stories that the late J. Edgar Hoover, the first and longest serving director of the FBI, wanted the public to see. (I love the two films anyway, as they are good dramas). Burrough's book gives us the true story of the early FBI and the sordid tale of the rural bank robbers and kidnappers that captured the public's imagination in the 1930s, and to some extent, still does today. As Burrough explains in the book, bank robbers were known as "Yeggmen," or "Yeggs." One influential Yegg, although not as well known as Dillinger, was Herman K. Lamm, A former German army officer known as "The Baron." Burrough offers a brief history of Lamm, who devised the bank robbery system later used by the Dillinger gang. Lamm pioneered the "casing" of banks by observing bank guards, alarms and tellers. He also gave specific roles to gang members, such as the lookout, the getaway driver, the lobby man and the vault man. Lamm also devised the first "gits," or getaway maps and plans. Lamm was killed in a shoot-out in 1930, but two of his men taught John Dillinger his system in an Indiana prison. Burrough states that three innovations of the age aided the bank robbers in the 1930s. One was the Thompson sub machine gun, introduced after WWI, which outgunned the local lawmen. Two was the new automobile models with reliable, powerful V-8 engines, which allowed the outlaws to outrun the local lawmen. And the third innovation was the interstate highway, which lawmen could not use beyond their local jurisdiction. Bank robbery was not yet a federal crime. Burrough makes the point that after the crime surge in the 1920s, symbolized by Chicago gangster Al Capone, there began a public debate over the need for a federal police force. 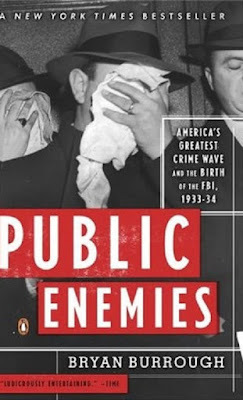 The rise of kidnappings and bank robberies fueled the debate, as did the "Kansas City Massacre," where, in an attempt to free a criminal cohort in federal custody in front of the Union Railway Station, gang members opened up on FBI agents and local lawmen. An FBI agent was killed, along with two Kansas City detectives and an Oklahoma police chief, as well as the prisoner they were trying to rescue. The hunt for the Kansas City killers, the Dillinger manhunt, Machine Gun Kelly's kidnapping of Charles Urschel and the Barker-Karpis gang's kidnapping of Edward Bremer and William Hamm, are all well-covered in Burrough's book. Burrough also recounts the many failings of Melvin Purvis, whom the press of the day loved, and he writes about FBI Inspector Samuel P. Cowley, who although not as well known as Purvis, was placed over Purvis by J. Edgar Hoover. Cowley, a desk man who failed to qualify on the pistol range, would go on to shoot it out with Baby Face Nelson, both of whom later dying from the gunfire exchange. The hunt for the public enemies of the 1930s made a star out of Hoover, and although he later greatly abused his authority, I believe he should be credited for creating one of the world's most efficient law enforcement agencies. He also helped to diminish the "Robin Hood" image of vicious, murdering criminals. But having said that, I'm thankful that Bryan Burrough has written a fact-based book that shatters the many myths about this fascinating period in history. I hope the upcoming film will be equally as good as the book. Note: The above column originally appeared at GreatHistory.com in 2009.